Would you be willing to help others whose lives are in great danger? Would you be willing to put your own life in danger to help others? Frans and Mein Wijnakker did. They were a young Catholic couple who opened their home to Jewish refugees during Nazi Germany's brutal occupation of Holland. 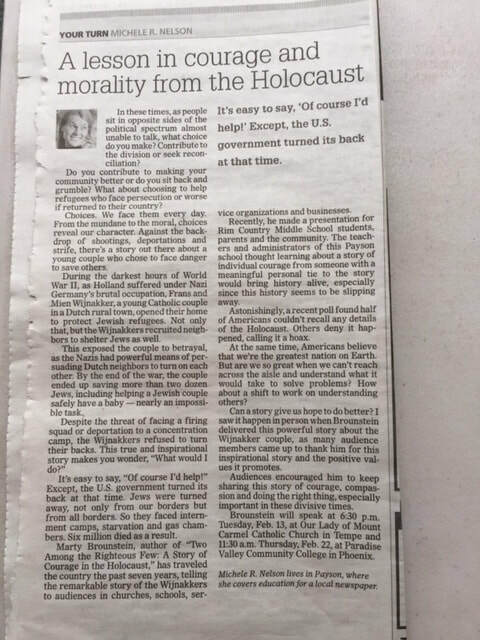 Marty Brounstein, author of "Two Among the Righteous Few: A Story of Courage in the Holocaust", recently shared this story at the PVCC President's Leadership Luncheon. Despite the risk of facing a firing squad or deportation to a concentration camp, the Wijnakker's saved more than two dozen Jews. Brounstein has close ties to one of those survivors (hint: picture above) which has motivated him to tell the Wijnakker's story around the country. In the end, his story teaches us that we all have a role play and should ask ourselves how we can create a positive social change in our communities. The article had great impact, nearly doubling the size of the audience for two following speaking events held in the Phoenix area. One recent poll found only half of Americans can provide details about the Holocaust during World War II. Many who do say they have heard of the holocaust say they think it’s a hoax. Ignorance runs especially deep amongst schoolchildren — especially given the struggle to keep history courses from getting crowded out by the emphasis on reading, math and basic academic skills. But at least 250 Rim Country students now have a searing, inspiring account of the Holocaust — which included the systematic murder of an estimated 6 million Jews during World War II. At Yad Vashem — The World Holocaust Remembrance Center in Jerusalem, there’s a special section dedicated to “The Righteous Among the Nations,” non-Jews who risked their lives to save Jews during the Holocaust. Among those honored are Franciscus and Hermina Wijnakker (known as Frans and Mien), a Christian couple in the Netherlands who saved the lives of more than two-dozen Jews. 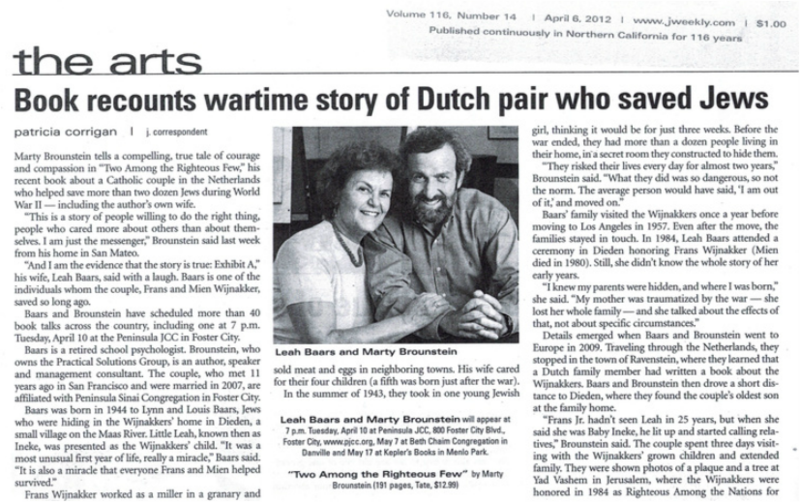 Author Marty A. Brounstein has written a book, “Two Among the Righteous Few: A Story of Courage in the Holocaust,” about the Wijnakkers’ selfless acts, and will hold several lectures around the Valley (see details below). 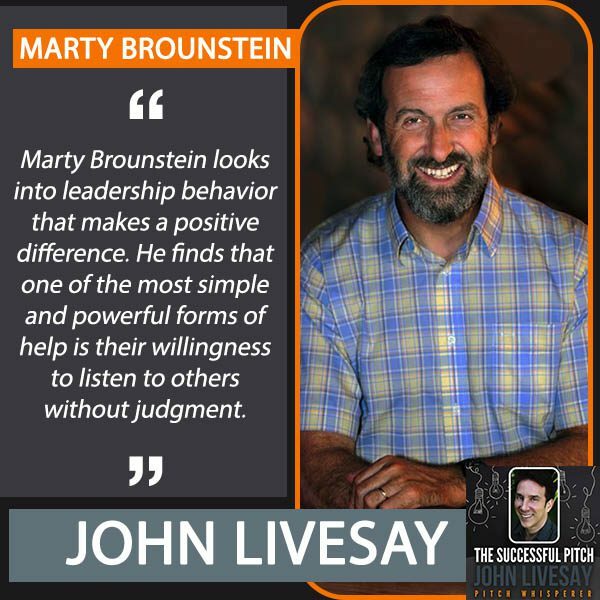 Brounstein has a meaningful personal connection to the story and its heroes, which he reveals in his talk. ​To give the reader historical context, Brounstein details events leading up to Germany’s invasion of the Netherlands and what life was like during the occupation and control of the Nazis. In 1943, with World War II well underway, Frans Wijnakker made his living traveling throughout Holland selling black market meat and eggs. While in Amsterdam, Frans called on a doctor he’d met during a prior visit, who asked if he would be willing to take a 14-year-old Jewish girl named Freetje (real name Shulamit Laub) into his home for a few weeks. Frans, who wasn’t fully aware of the Jews’ persecution in the Netherlands and other countries, said yes. Hiding Freetje turned out to be just the beginning. Throughout the remainder of the war, the Wijnakkers saved many Jews from the Nazis, aided by a network of people willing to help. The interview begins at time 16:55 in the audio. America Meditating is a Radio Show, out of Washington D.C.
A weekly segments show with Randy Miller and Jerry Newberry that started airing on July 4, 2015. The courage and compassion to do the right thing – it’s the prevailing theme that resonates with audiences when they hear San Mateo, California author, Marty Brounstein, talk about his book, Two Among the Righteous Few: A Story of Courage in the Holocaust. He tells the story of a Christian couple, Frans and Mien Wijnakker, who saved the lives of over two dozen Jews in the Netherlands during World War II and the Holocaust. This true story has all the elements of intrigue, complete with hiding rooms and Nazi soldiers showing up on doorsteps only to retreat when they find nothing of interest. Turns out, this remarkable story has a meaningful personal connection to Brounstein, one he’s been revealing to standing-room-only audiences since 2011. This unexpected journey has taken Brounstein to ten different cities across the country, where he’s completed nearly 400 speaking events in churches, synagogues, community centers, social service organizations, private homes, Rotary Clubs, bookstores, schools, universities, libraries, book clubs, a Holocaust museum, a history museum, professional conferences, and workplaces. Now his story has caught the attention of a Hollywood production company, where efforts are underway to turn it into a feature film. Marty does interviews around the story and the Theme: Having the Courage and Compassion to do the Right Thing. *Please look for his coming speaking engagements on the Public Events Page.